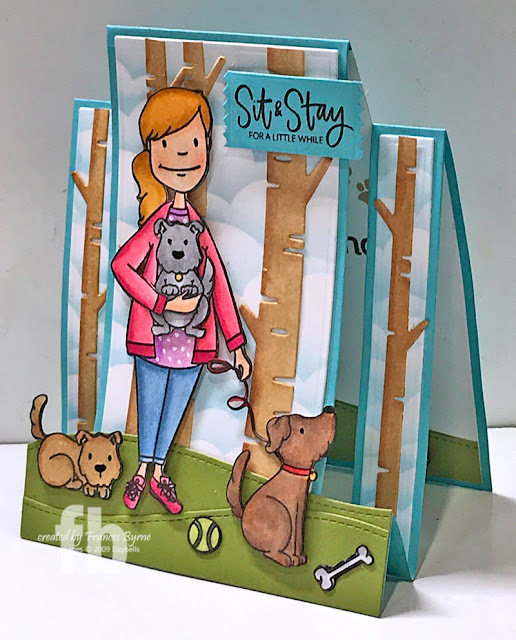 Today I am sharing a card using one of Ellen Hutson's Leading Ladies stamp set ... Dog Lady. 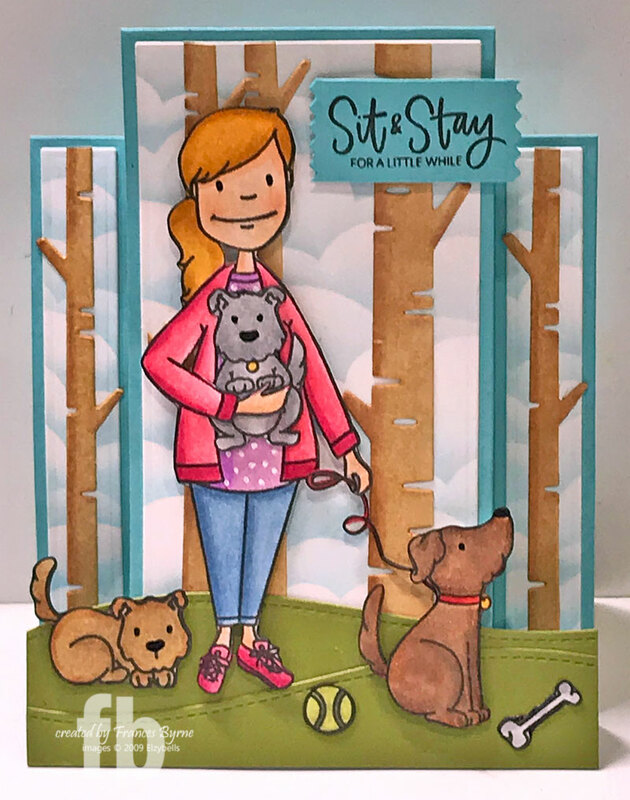 For the base of my card I used Divinity Designs Center Step A2 Card die set and the coordinating Center Step A2 Layers die set. To create my scene I die cut the three layers for the top portion of the card and used MFT Stamps Cloud Stencil and Tumbled Glass Distress Oxide inks to add the clouds to the background. I then die cut Lawn Fawn's Birch Trees and added them to my cloud background before adding these panels to the Center Step card. For the grass I used two dies from Lawn Fawn's Stitched Hillside Borders die set, die cutting from green cardstock. The stamped images where then adhered to the card. For the sentiment, I used one from the stamp set and die cut it using Honey Bee Stamps Banner Builders die set and adhered the sentiment to the top right hand side of the card. For the inside of the card I die cut the back of the Center Step A2 Card from white cardstock and then trimmed it down on both sides and the bottom. I adhered another tree and some grass and added two more of the images from the stamp set. 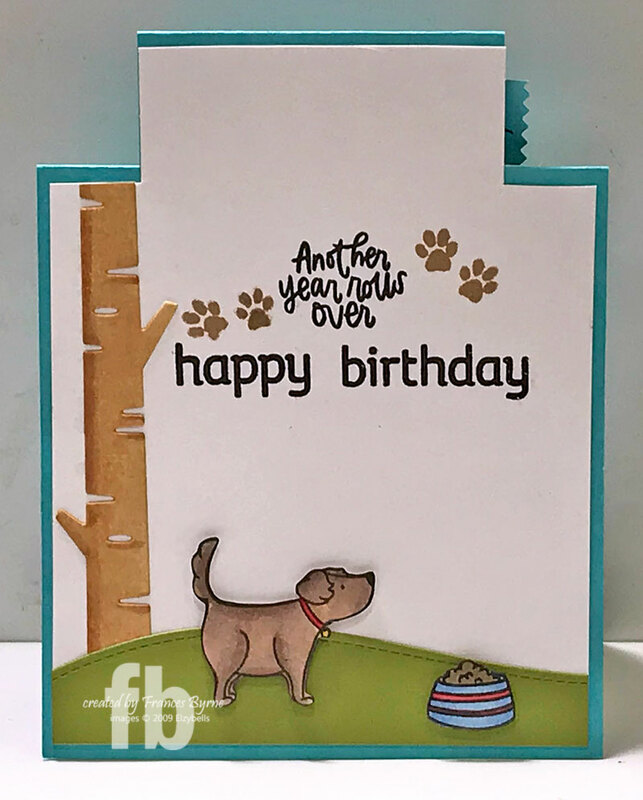 I added the "Another Year Rolls Over" sentiment to the top of the card and then added the "Happy Birthday which is from Altenew's Birthday Builder stamp set. Such a sweet Center Step card ... I adore all of those images.